I am a DIY'er who is remodeling my bathroom. I have done a full bathroom remodel in the past (walls and floors down to studs and built up from scratch) so I am not thoroughly without skills and knowledge. 1. If there are holes in the rubber sheet, where it was nailed to the 2x4 stack curb (which I will be replacing with a taller pre-made curb), can I patch the holes? And if so, with what? Liquid membrane waterproofer? Patch material? Patch with pieces of the existing rubber liner cut from scraps? Bicycle patch? 2. When removing the tile from the pan, it seemed to pop right off the thinset, which appears to still be on the pan. Do I need to scrape/grind this off before applying the new thinset/tiling? And if so, any suggestions of what is the best way to go about this? If not, do I need to do any surface prep to the existing layer before applying the new thinset? Thanks in advance for the replies. I am sure there will be more to come up as the project progresses. While there are times when I would agree to replace the shower pan and the bottom of the walls as a short-term repair, there is not case at all where I would replace the shower walls and re-use an existing shower pan. Traditional shower pans are just too simple and too inexpensive not to replace and start your fifty-year life cycle all over again. But that's up to you, of course. As for trying to patch your traditional liner, the method for that would depend upon what material it is. Do you know the difference between PVC and CPE as it applies to such material? PVC is the more commonly used material in that application, but CPE is used extensively in some parts of the country. My opinion; worth price charged. Y'ALL NEW VISITORS READ THIS HERE! I have never done a cement pan before. 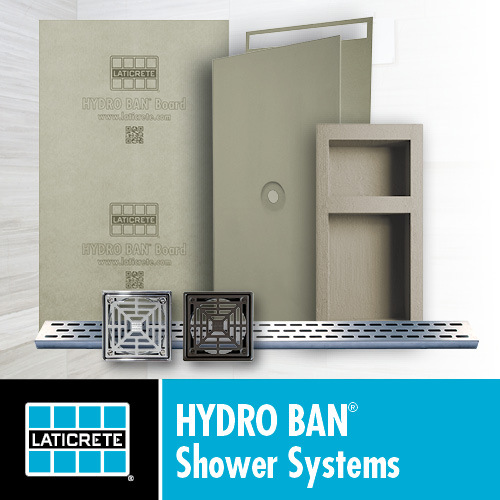 I would probably purchase a shower basin from KBRS (with side walls and curb attached), as I had a great experience with using this product before. Not knowing the condition of it, Nick, and the receptor (pan) being the most critical part of the shower. Pan might have been working fine before the demolition, but you'll be spending a good bit of money and effort building a new shower over a pan that's now in unknown condition. Well, unknown except for patching at the curb, which is the most critical area of the pan to begin with. Show us some photos of what you have, 'specially the areas where your patching and changing will be done. Here are some photos of what I am dealing with. The rubber liner was nailed through when they attached cement board to the 2x4's to tile onto. The plan was to take out the 2x4's and replace with KBRS Hardcurb, sandwiching the rubber liner between the existing pan and the new curb, rolling it over the top and stapling/screwing it on the outside. As for the walls, you can see the gap spaces along the "back" of the pan where the cement board will slot in, on the inside of the liner. What about the surface of the pan? if I were able to salvage the pan, what could/should be done to it? What we can see there is why I'd not wanna build a new shower over an old shower pan. You have no real hope of adequately patching the holes in that PVC liner with it being that dirty, which is the condition you'd expect to find. Then there is the treatment, or lack thereof, of the joints between curb and walls. Nothing at all wrong with the wood curb unless it's already water damaged. If you just want it higher, add another 2x4 on top of what you have and be sure to slope it to the drain. But really, I'd remove everything I see there and install an adequate pre-slope if required, a new liner that is high enough, folded properly, treated with dam corners at the ends, and covered with metal lath and fat mud for a very good installation. Can you determine whether there is a pre-slope under your existing liner? So I will be taking out the existing pan, liner, etc. I have never built a mud pan, and am a little leery about the rubber liner. What are my other options for a waterproof layer? Can I create a sloped mud pan and then use a waterproof membrane over it (solid sheet like kerdi, or liquid membrane material)? I used the KBRS premade slope & curb in a shower remodel I did at a condo I own, and in conjunction with their waterproof liquid material, the shower stall was sealed up tight. I would prefer to do something like that as opposed to a pre-slope, rubber sheet and then sloped pan. It seems like too many opportunities for water to collect, leaks and weeping, etc. If that were my shower I'd use the Laticrete Hydroban system which includes a bonding flange drain. Because of the footprint you will not find anything pre fabricated for the slope so a mud bed will be in order. So would your suggestion be to use the Laticrete liquid material over a sloped and fully dried mud bed? I would assume that similar to the KBRS liquid membrane, I would need to use fabric at the edges and seams and then roll the liquid right onto the dried mud bed (and the cement board walls)? You are going to imbed alkaline resistant mesh in thin set on all of the seams and corners of your wall board including the curb so no additional fabric will be needed,,,,,,,,,,,,,, however I always used to use fabric at the wall/floor junction just for sleeping better. Yes the entire shower will be covered in hydroban. A bonding flange drain must be utilized in the process. Well I have decided to go the Kerdi route to waterproof my shower and have a question, as I am using this product for the first time. The three walls of the shower stall (think 6 sided hexagon) that are to be tiled, are all 12 feet tall. Two side panels to get 12x12 tiles and the center wall to get glass/stone/ceramic mosaic. All three to the full height of 12 feet. I am installing a shower panel with shower head, body spray jets and hand-held, which mounts on to the wall after tiling. The shower head will be no higher than 7 feet when it is mounted. How high would you recommend I mount the kerdi membrane up the walls? Currently in the space above the area where tile was removed (again at about the 7 to 7 1/2 foot level) is painted drywall, so above the shower head level the tile would be applied directly to he painted drywall. As there is very little moisture up there (ambient moisture in the air considered), do I need to Kerdi that high? What could/should I do instead? Install kerdi up to the height of the shower head, minimum. You can go higher if you want. Sand the painted area a little to scuff it up and give the thinset something to bond to, than you can tile right over it. And just to confirm, if I am using the Kerdi material, I can put regular drywall up as the substrate material under the Kerdi membrane? Correct? Nick, it'll help if you'll keep all your project questions on one thread so folks can see what you're working on and what's been previously asked and answered. We can give it a more generic title any time you'd like to suggest one. Some of us would have a difficult time thinking any other kind, eh?